It is now 3:00 pm, December 2, 2014, in New York, and I am on my notebook to write this post on the bearish shark pattern, a very popular harmonic chart pattern. In this forex trading guide, I already wrote so many posts about the price action chart patterns. 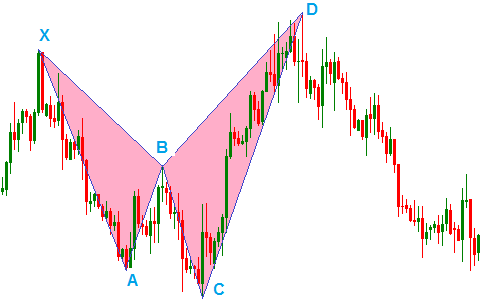 Bearish shark harmonic chart pattern formation on the price chart is a signal of a bearish trend. The effectiveness of this pattern greatly depends on how accurately the pattern is drawn. The first step to draw a bearish shark chart pattern is finding the X and A points. X and A points are found at the top and bottom of a strong bearish trend respectively.The second step is to find the B point. In case of bearish shark chart pattern, the Fibonacci ratio of X-B is not remarked, but I personally prefer a 0.50 Fibonacci ratio of X-B. To find the B point a Fibonacci retracement is drawn from X to A. The Fibonacci ratio of X-B is 0.50 which is found at the 50.0% Fibonacci retracement level. In third step the point C and the ratio of A-C is determined. 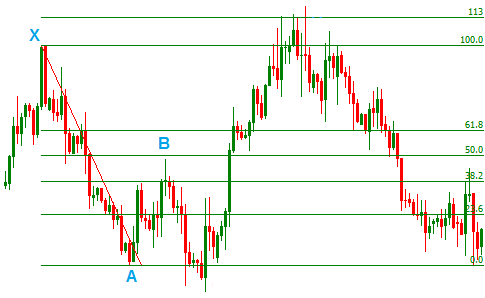 A Fibonacci retracement is drawn from A to B. From the above image, the A-C Fibonacci ratio is found 1.13 at 113% retracement. In fourth step a Fibonacci retracement is drawn from B to C to find the ratio of B-D. For a bearish shark pattern the ratio of B-D should be 1.618/2.24, here in the above image the ratio is 2.24, which is found at 224% retracement level. In fifth step a Fibonacci retarcement from X to C is drawn to find the ratio of X-D. Here the ratio of X-D is 1.13, which is found at 113% retracement level. In the final step XA, AB, BC and CD straight lines are drawn to find the bearish shark chart pattern. 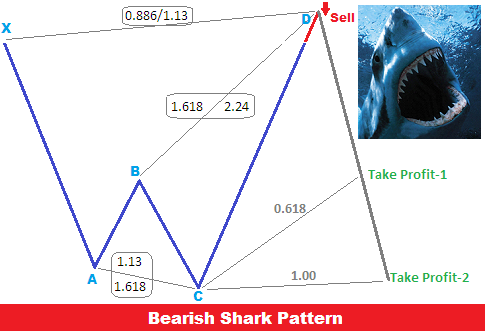 We can see drawn bearish shark chart pattern satisfies the conditions of an accurate bearish shark chart pattern. After learning the way to draw a bearish shark chart pattern, traders should learn 'how to trade forex with bearish shark chart pattern'. Generally, a sell/short order is placed upon completion of the bearish shark chart pattern, that means a sell/short order is suggested when the D point is confirmed. The profit target is placed at the 50%, 61.8%, or 100%. 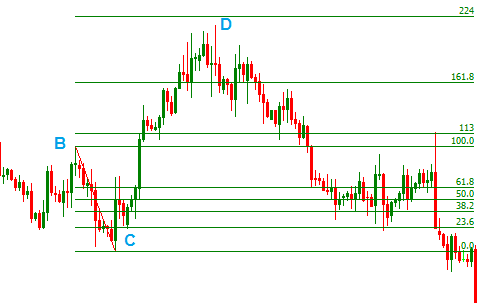 To find the profit target levels a Fibonacci retracement is drawn from C to D.
Smart forex traders not only wait for a bearish shark pattern to be completed rather trade along the whole pattern formation. When the C point is confirmed a buy/long order can be confidently placed. 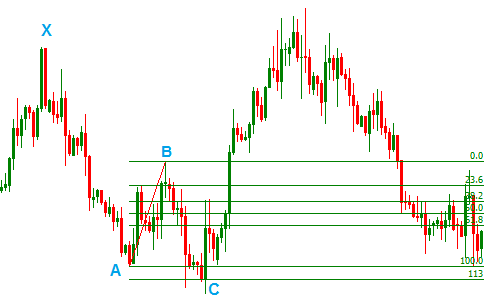 Other points in the pattern can also be considered to find the entry and exit signals. Other technical indicators can be applied to confirm the entry and exit signals.